Withdrawal is the first step towards addiction recovery, but it’s an often misunderstood part of the process. 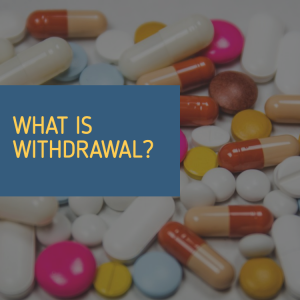 The term withdrawal refers to the symptoms someone with a substance abuse problem experiences after suddenly stopping the use of drugs or alcohol. Withdrawal typically begins within a few hours of when the abused substance leaves the bloodstream. Withdrawal occurs because drugs and alcohol make changes to how your brain processes emotions and regulates mood. These changes flood the body with neurotransmitters, like dopamine and serotonin, to create an artificial high. When the body doesn’t get its fix of the addictive substance, it takes time for the brain, nervous system, and vital organs to return to functioning normally. Since addiction is a disease, willpower alone can’t stave off the symptoms of withdrawal. The mood changes associated with withdrawal depend on the type of substance being abused. Generally speaking, someone who has been using depressants such as alcohol or opiates will experience a period of overstimulation during the withdrawal process. At the opposite end of the addiction spectrum, someone who has been abusing stimulants such as methamphetamine or cocaine will experience depressive symptoms. In rare cases, the depressive symptoms associated with withdrawal from stimulants can lead to attempts at self-harm. Although most withdrawal symptoms are merely uncomfortable and not physically dangerous, severe alcohol abuse can result in a potentially deadly condition called Delirium Tremens (DTs). Approximately 3-5% of alcohol abusers are at risk for DTs during the withdrawal process, with the highest risk being among those who have been struggling with alcoholism for 10 years or more. The symptoms of DTs are similar to other types of withdrawal, with added hand tremors, irregular heart rate, dehydration, and fever. Without treatment, loss of consciousness and potentially fatal seizures can result. It’s important to keep in mind that the serious symptoms of DTs don’t begin immediately. Sufferers experience mild withdrawal symptoms first, with the risk for seizures peaking 12 to 48 hours after the last drink. Someone who is suffered from DTs can be treated with intravenous fluids, vitamins, correction of salt and water imbalances in the bloodstream, and sedative medications. Severe cases of withdrawal from benzodiazepines can also produce a condition similar to DTs. The intensity of withdrawal symptoms tends to peak in the first 24 to 48 hours, which is when a substance abuser is most at risk of relapse. After this point, discomfort is reduced to a milder level and more easily managed with exercise, rest, and proper nutrition. Post-acute withdrawal is a term used to refer to the ongoing symptoms someone experiences while in recovery. These symptoms are primarily emotional in nature and can include cravings, anxiety, irritability, fatigue, and trouble concentrating. Episodes of mood disturbances will come and go, but can appear as long as two years after the initial withdrawal experience. In people who don’t seek professional addiction treatment, post-acute withdrawal episodes are well known as a risk factor for relapse. People who suffer from drug or alcohol addiction and a co-occurring mental health disorder such as depression or anxiety can have more intense mood changes during the withdrawal process. Physical conditions such as high blood pressure or diabetes can also affect the severity of the withdrawal process. For treatment to be effective, co-occurring disorders must be addressed simultaneously. It can be extremely uncomfortable and potentially dangerous for someone with a substance abuse problem to attempt to go through withdrawal alone. During withdrawal, substance abusers aren’t thinking clearly and can’t properly monitor their symptoms. For this reason, medically supervised detox is the first step of treatment in an inpatient residential rehab center. In medical detox, a substance abuser’s symptoms and vital signs are closely monitored and managed with appropriate pharmaceutical interventions. Holistic therapies such as massage and acupuncture can also be used to provide the safest and most comfortable beginning to the recovery process.